Every time I visit my grandparents house, my grandma turns nuts with me and my obsession with antique clothing. Imagine all my family running behind me, because I'm opening all wardrobe doors looking for any vintage treasure. True story. Last time I went there my grandma found a really great gift for me: a polka dot 70's dress she wore on a family event about thirty years ago. As she doesn't wear it anymore, and she considers it ''old fashioned'' (I don't!) she gave it to me, and thought I would never wear it seriously. How mistaken she was! Although I don't usually like 70's clothing style (and don't dare to name 80's to me, please!) this dress is so simple, and the polka dot pattern in white and blue is so lovely and stylish that I couldn't avoid pairing it with some white and red accessories, to create my own navy style. This is what vintage means to me: revamp old clothes. Give them a new life, and try to adapt this clothing to new trends and 21st Century. It's not about looking like you escaped from an old B&W movie (okay, it's great for some special events, but...), but always looking for the mix&match philosophy. 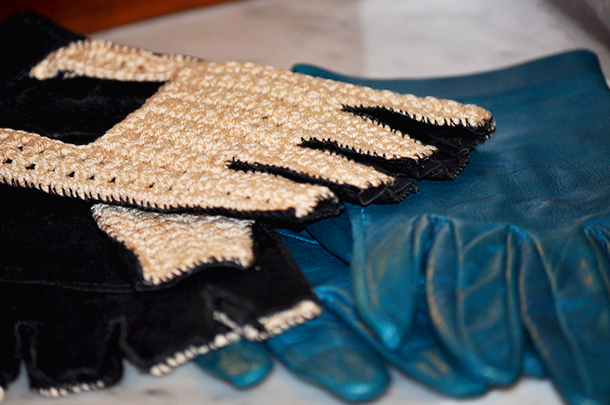 Do you follow any guidelines when matching vintage pieces? Or you just take the piece as it was an actual garment? Do you also steal your grandma's clothes as I do? Fallas were finally burned Tuesday's midnight. 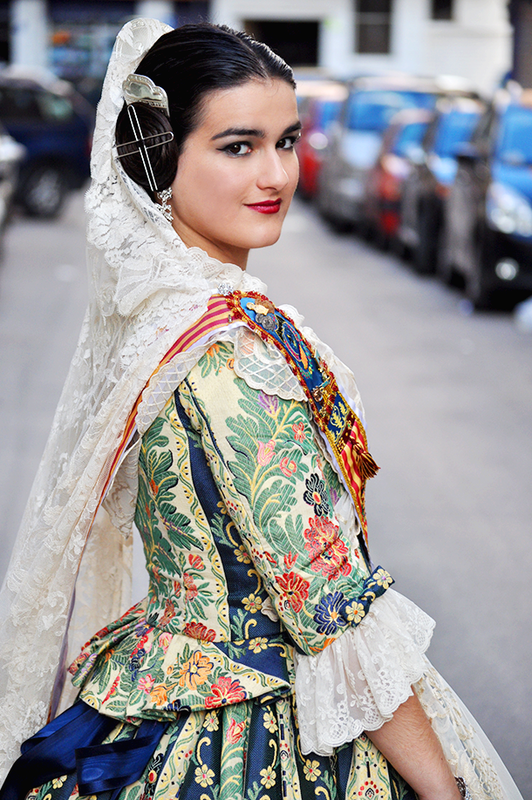 But I couldn't avoid uploading this pictures, so you can really see what a fallera costume looks like. I think it's the other side of fashion, isn't it? Tradition and typical culture of each part of the world. I personally love to see how different fashion can be depending on where you go, and how each culture has its own way to see things which you can discover through fashion and what they wear. It may seem uncomfortable as it's a very voluminous costume, but once you wear it and you get used to it, you walk downtown with your friends wearing the same costume, and you see lot's of people taking pictures of all the girls looking like this... Well, you know it's worth it, because you're helping other people to understand what you feel living here. These days make me a bit angry, especially when it comes to clothing. In the morning the sun is always there, and the breeze is soft, so there's no problem to go out with a pair of light trousers and a cool blazer. But then arrives the evening/night, and I become crazy: no light clothes, just my scarf, gloves, and coat. So, I never know what I should wear. Will it be cold? Will it be warm? When I'm having this kind of ''temperature fashion issues'' I always follow this rule: become an onion. Really. Basically, chose one great piece and start putting layers and layers of jackets and vests. Last night I decided to wear this long-sleeved peplum dress, in case it wasn't too cold, and especially a great choice when it comes to staying inside. For the outerwear, this long pink coat I've been having in my closet for some years. The downside: I'm not able to wear it without heels: it's too long, and I'm at risk of looking like a pink elf. 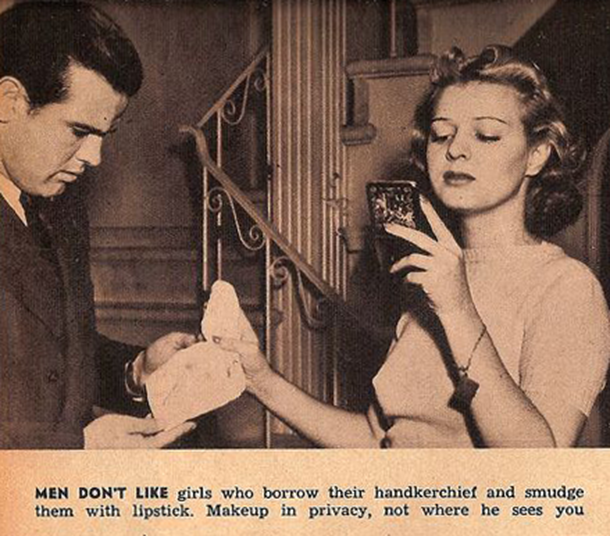 Seems like on the 40's the most stylish and wonderful woman was that single lady who didn't talk in front of her conquest, didn't drink too much or even wore a bra! 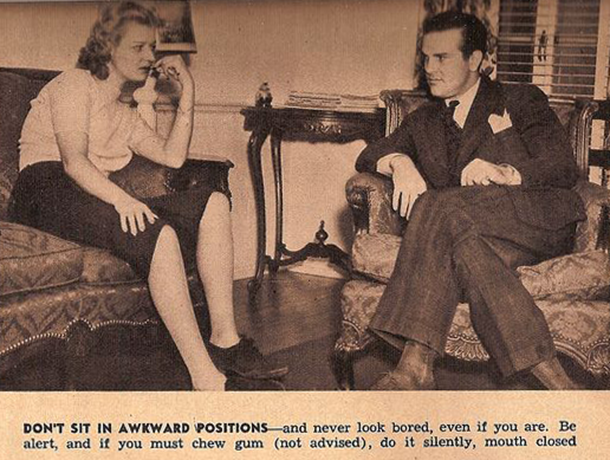 This pictures will show you what you were supposed to do in a 1930-40 date if you wanted to get the man. Fashion is also about society and culture, and while it's helped by them to be built, fashion also helps itself to define society. It's a feedback, so because of that, it's great to know what has happened before. In key of humor, these pictures are a good example of how society changes over the years, and a good way to look back, but, have we actually changed so much? There's obviously so much to do to beat some roles most women have accepted just because we're women, but it's somehow educational to know how we were seen back on those years, and how many things have changed since then. There's still so much to do to achieve an equalization between man and woman on this society, but, if there's something I'm glad about is that there's already some kind of consciousness about roles and gender. What do you think? 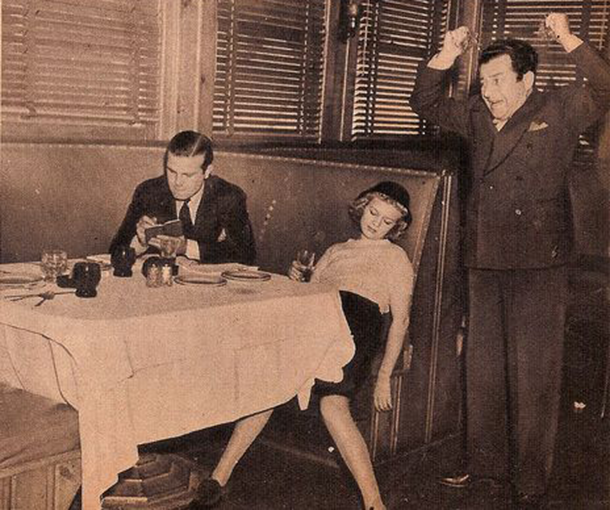 Are this pictures too old fashioned, or there's something girls still should do on their dates? Fallas have already arrived. Every year from 15th to 19th March, Valencia celebrates its most internationally known festival, where you'll find fire, music, color and fireworks 24hrs a day. The most famous thing around here these days are the fallas, which are basically huge figures made of wood, sometimes cardboard dolls (called ''ninot'') on the streets, which represent human figures, animals, different sceneries... Then, on 19th at night we burn them, to symbolize that winter has gone away and a new year starts. Tomorrow I'll be wearing my typical fallera costume (which is full of flowers and jewelry and things... Not following my usual ''less is more'' philosophy at all...) but for now, here's the outfit I wore to go for a walk around the neighbourhood this morning, to take some pictures of the nearest monuments and show you what is like. Fashion also means tradition and culture, that's the only way you can understand why someone dresses like this or that. That's why I'm talking to you about fallas and how the atmosphere feels around my city this days. 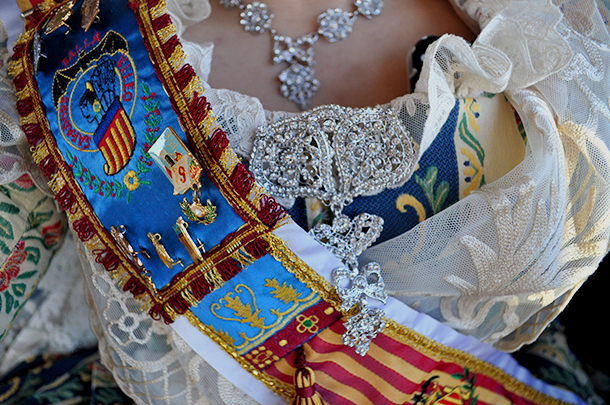 Fallas, our most internationally known festival are about to come. 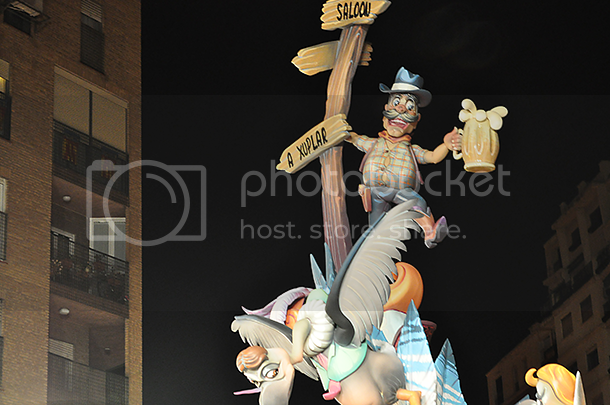 So, once a year, on the falla association we celebrate a Gala Ball, where everybody celebrates that is time for party, fire on the monuments and music on the streets. 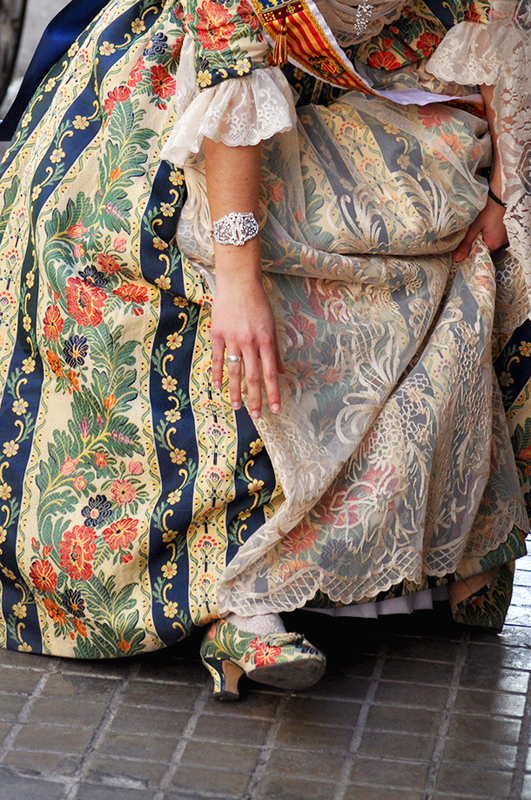 If you're curious about this festival in Valencia, here you'll find some useful info. I think this is one of my favorite events on the year. It brings me the possibility of wearing long and awesome gowns, and feel once a year like I can walk on the Oscar's red carpet. 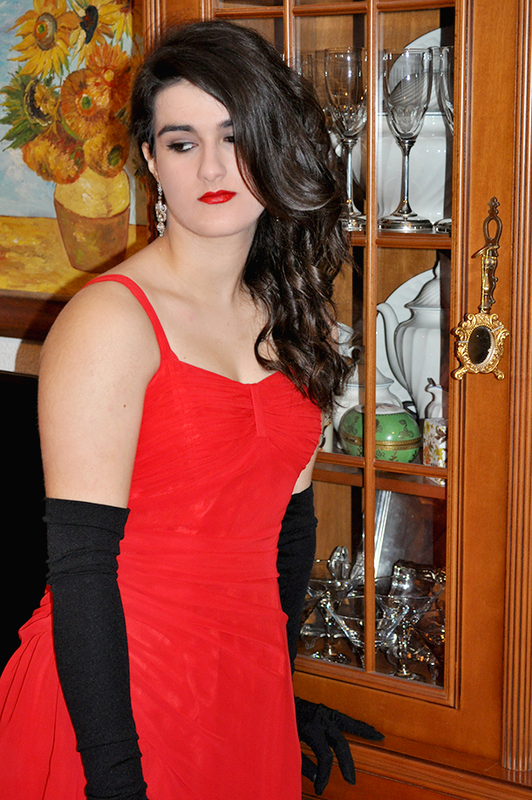 This time I decided to go for a very ''Old Hollywood'' inspired look, like Rita Hayworth on ''Gilda'' on the 40's. 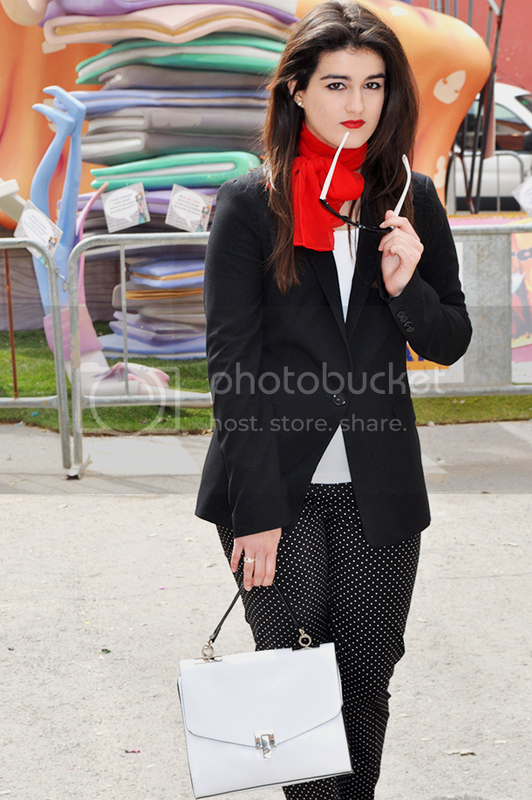 I found this outfit quite difficult to match, specially because I considered it a ''full'' outfit. I mean any thing I was wearing had some connection with the other items, so everything together creates the 40's look illusion. The makeup is a bit more overdone than usual, with a cat/winged eyeliner but light colors on the eyeshadow. Maybe you've noticed there were some problems with the blog access lately, but don't worry. It's me changing things and touching the domain configuration. 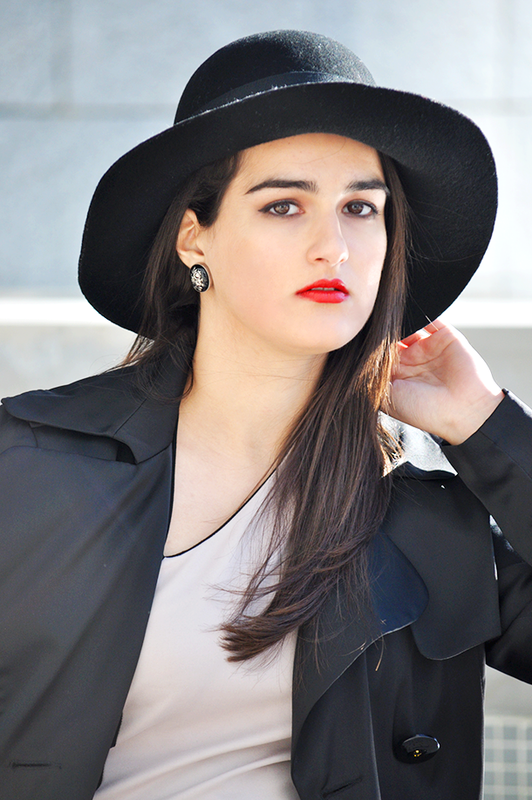 Luckily, the new domain will be www.somethingfashion.es for now on. I've been also working on some great class exercises I'll show you soon. I think I'm going to dedicate a pair of posts only about some architecture things I've been studying. So stay tuned! On my latest post I told you I visited Madrid recently. Actually I went with my Architecture friends two weeks ago, for four days on the city full of tourism, museums, architectural seeings, pictures... We had a great time there, and the weather was amazing! We visited the Reina Sofia Arts museum, Atocha Train Station, we did some shopping (and I came back to visit some of my favourite vintage stores there) and so on. I can't even believe that I've visited that city twice in less than a year. This outfit pictures weren't actually taken there, although I wish they had. This were took on a morning out in the city, when weather started changing and it became windy. Believe me, it was horrible to try walking on high heels and a straight dress trying to avoid your hat fly because of the win. Anyway. As always, I've tried to match a dressy outfit, simple and clear with my French Connection side lines dress (have I ever told you how much I'm in love with sales?). I love how neutral and stylish it is, and how the side lines makes the body look super stylized. The assymetric cut on the neck makes it less serious and more feminine. Paired with a pair of black pumps and a gabardine, voilà!